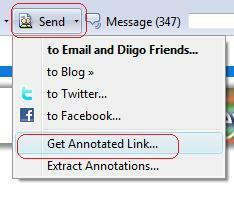 Tip of the day: "Get Annotated Link"
Have you ever wondered how you can share your “diigoed” page with someone who may not be a diigo user? No problem ~ it’s actually quite easy with Diigo’s innovative “Get Annotated link”! You can also do a quikc preview or Twitterthis right away. Check it out and see how easy it is to share more of your online discoveries with your friends and colleagues! Next > Diigo is a CNET Webware 100 finalist! Semi-related question. On the Enhanced Link Rolls, is there a way to tell the linkrolls to never ever display a link to the annotated copy of your bookmark? In other words, I just want to display a link to the bookmark’s page, never to my annotated copy. I cannot find an option to turn that off.